I truly disagree with looking for ideas in 13Fs. It is a shortcut that short-circuits the thinking process. Akin to copying off your neighbor’s test and then making up your work product to get the answer you copied. Brice's previous article, Of Castles and Moats, is another great read. On Seeking Alpha, "Slim Shady" argues that Amazon overstates its cash flow. He writes that when a company emphasizes a particular financial metric, as Amazon does with cash flow, it has a strong incentive to manipulate it. I've been meaning to review Mulford and Comiskey's Creative Cash Flow Reporting. Investors generally consider cash flow more reliable than earnings, but the book gives lots of examples of how it can be gamed. Philosophical Economics writes about how CAPE can be misleading. No valuation metric is perfect, but he makes a strong case that CAPE is less reliable than most. According to the Bank for International Settlements, "Foreign-debt levels of companies in emerging markets from China to India and Brazil are underestimated, threatening financial stability." In Barron's, Anne Stevenson-Yang claims that "Chinese corporations have taken on $1.5 trillion in foreign debt in the past year or so, where previously they had none. A lot of it is short term." I haven't been able to verify the number, but it's ominous if true. Taking the $77.979 billion that Canadian farmers owed in 2013 and dividing it by $53.890 billion (the total cash receipts which Statistic Canada reported Canadian farmers received that year) we get a ratio of 144.7 per cent... the U.S. ratio of farm debt to total farm receipts is much lower at 69.4 per cent. [A]ccording to the 2013 FCC Farmland Values report, the average increase in farmland value in 2011 was 14.8 per cent, followed by increases of 19.5 per cent in 2012 and 22.1 per cent in 2013. In Australia, Canada, and the U.S., land purchases have been a driver of rising farm debt... the USDA estimates the average increase of land values from 2012 to 2013 at 13 per cent. 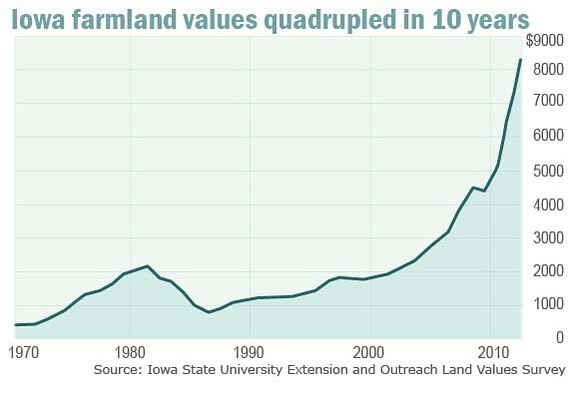 Real farmland prices in the United States are at all-time highs, far above their historical average. Country Guide mentions that "The Federal Reserve Bank of Kansas City... surveyed farmers to find out why farmers were buying land." Their top three reasons were 1. The interest rate environment, 2. Overall wealth level of the farm sector, and 3. Lack of alternative investment options. (I would argue that #3 is really a variation of #1.) This is classic bubble behavior: they're reaching for yield and using rising asset values as a reason to increase debt. Following David Einhorn's recommendation of Greek bank stocks, Vienna Capitalist writes a more skeptical take on Greek banks in general and Piraeus Bank in particular. "davideinhornnyc" responds in the comments. Vienna then writes a two-part rejoinder to Einhorn's comments. The arguments are too complex to summarize, but Vienna makes a lot of good points. I think the funds that are buying things like Greek bank stocks and Puerto Rican debt are making a mistake. Dislocated Value offers some impressive commentary on Hertz. Like Vienna Capitalist's series on Greek banks, it's too detailed to summarize, but his opinion is that "I am not entirely convinced that HTZ is a good investment – the bottomline is that, post the run-up, corporate EBITDA stands at 9.5-10x based on my assumptions, and the fix on pricing will take some time." The worst hand in poker is the second-best hand. This is the hand that incentivizes the player to bet heavily without the odds in his or her favor. It is the poker hand that offers the player the greatest risk of loss. Competent players know to fold a two-seven off. Gifted players know to fold the second-best hand. A similar framework applies when thinking about industry structure in cyclical, commodity businesses... The worst industry structure is the second-best structure – an industry that is “almost-consolidated” with fewer participants, but not so few that pricing has become rational. The Wall Street Journal writes about Australia's iron ore miners. They're all expanding production while blaming each other for the resulting oversupply. Joe Magyer from Motley Fool Australia interviews William Thorndike, author of The Outsiders. Regular readers know that I dislike the book, but I still enjoyed the interview. Magyer makes a great point about how tax laws and regulations influence the feasibility of Outsider strategies. Glenn Chan argues that investment managers' ability to identify scams is a good measure of their skill. (Chan has identified a lot of scams himself, particularly in energy and mining.) He mentions Jim Rogers, Prem Watsa, and "a famous Canadian money manager" as examples of prominent investors who have lost money on frauds and companies with flawed business models. I've written about Rogers and the famous Canadian money manager before and agree they're overrated. I don't follow Watsa closely, but his largest stock investments over the past decade are an all-star list of value traps: Abitibi, Canwest, Dell, Exco, Frontier Communications, Research in Motion, Sandridge, and Torstar. Brattle Street Capital writes that Whole Foods is between a rock and a hard place: various WF clones are stealing market share by offering a similar concept with lower prices, and Whole Foods can't respond by cutting prices without damaging its premium brand.